It is late here and I am tired from a long day of being at the courts that included supporting many of the USA players as well as two matches that I played. So this will be quick. The day started with me realizing that I have been way too on edge with the many organizational breakdowns regarding the Games. The shuttle buses from the various hotels to the Tennis Center, the internet challenges that impact on communicating with the team and the general confusion in the way the Israeli organizers of the tournament are operating have contributed to me feeling a lot of anguish. This is not who I am and I needed to fix myself. So this morning I reread a piece that I had written a year ago about how to free myself from mental anguish. It is a pretty simple method of questioning if I am in a state of acceptance about some situation that just is or if I am resisting, if I am in a state of non judgement or judging someone and if I am attached to a position of “right” vs wrong in a situation. Lastly, am I being forgiving or unforgiving of people or a situation that just is. If I am anguished I am clearly on the wrong side of one or all of these. Looking at the situations that are happening and asking these questions often frees me up. Sure enough, after reading what I had written, I was feeling freer and clearer. I meditated with Jo Ann overlooking the Mediterranean and all felt calm and sweet. Off to the courts for a 3:30 match against a good player. Marty Gilbert is an American born Israeli. 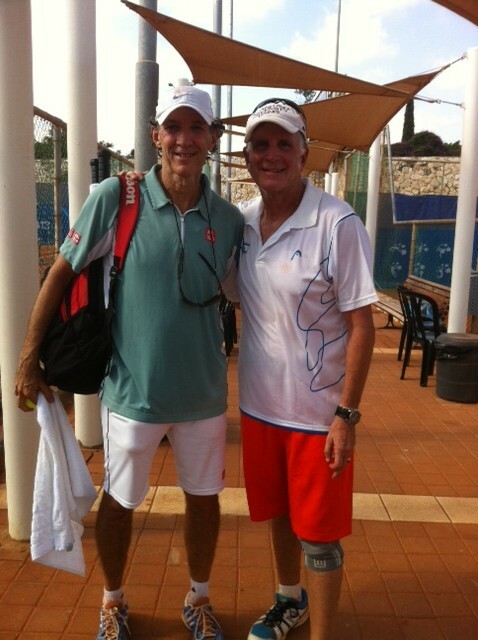 He moved here many years ago and heads up the Israeli Wheelchair Tennis Association. He has been playing tournaments for years. He is solid and was very sound in the warmup and I knew that I would need to focus early and deeply to get a good start. Things went exceedingly well as I treated each ball with deep focus. I won 8-0, losing 9 points in the match. He forced me to stay in each point and it made be play really steadily. His game fell off as the match went on but I kept up the intensity. Two hour break and I played another Israeli, my third in three matches (felt like they wee tag teaming me) but the guy was a couple of levels below me, putting no pressure on and having no way to hurt me. This type of match is challenging in that I could try to blow him off the court, hitting too big and then making errors on easy balls. I played totally within myself and once again lost only nine point in winning 8-0. Tomorrow two more matches in the morning. A great part of the day for me was hearing how some of the team responded to losses. A couple of the guys talked about how pleased they were with how they played even in losing. One said that he played to the best of his ability and even in and 8-1 drubbing he was proud that he played and competed for each point, never quit and represented himself, his team and the USA proudly. He knew that he had moved to a new level. Another remarked he solidly he played in a 2 hour 8-6 loss. This is great stuff and, as their coach and friend, I am proud on them. Too often players associated the result with whether they are good or bad. Great competitors make no excuses, don’t wallow in the past and take the good out of how they played. These players inspire me and I continue to aspire to be a good role model for them. Congratulations!!!!! You are terrific! Thanks for the updates and photos! We are so happy to be a part of your experience! Love to JoAnn! Hello, I am following your blog and would like it if you can identify people in your photos. Thanks so much and good luck tomorrow. Love the reminder on how to get out of our own mental anguish . It is a true pleasure to hear what is happening for you and JoAnn. Glad to hear your comments, especially how you dealt with your anguish. It helped deal with at a situation that has been causing me disturbance. Congratulations Bob, thanks for posting the photo of you and your opponent. Can you post a link to the draws please? Two more matches today and it’s all because of the way that people have been doing it on aussiessayservices.com/allassignmenthelp-com-review/. It’s all going to be great, but there will be nothing more to come.